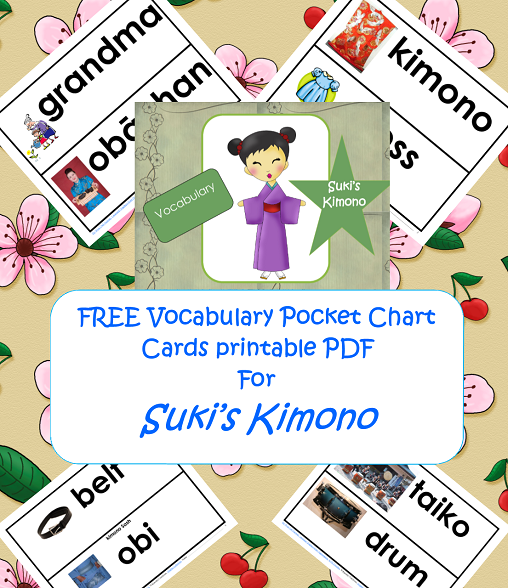 This post has a free printable with pocket chart card words for the book Suki’s Kimono. 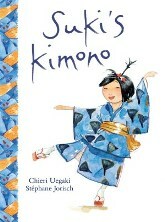 This book was written by Chieri Uegaki and was illustrated by Stephane Jorisch. This is a story all children can relate to as Suki wants to wear what she wants to wear to the first day of school, regardless of the advice of her family. Suki’s grandmother had visited during the summer and given Suki a cotton kimono, and that is what Suki wishes to wear on the first day of school. She is going to wear the geta (wooden clogs) that day, too! The older girls advise her to wear something else, something cool! They walk ahead of Suki on the way to school that day. She makes a friend on the playground after the friend asks why she is dressed so weird. Suki doesn’t think her clothes are weird, and explains why she has them on. She demonstrates a dance for this class that she learned at a Japanese street festival with her Grandmother. Of course, the story ends well. Most children have had at least a time or two when they wanted to wear something that wasn’t quite right for the occasion, or for sure they wanted to drag along a toy that wasn’t a good idea. Because children can relate to Suki’s having her own ideas, they will understand this story. Interwoven through the story are six Japanese terms that are defined at the very beginning of the book. 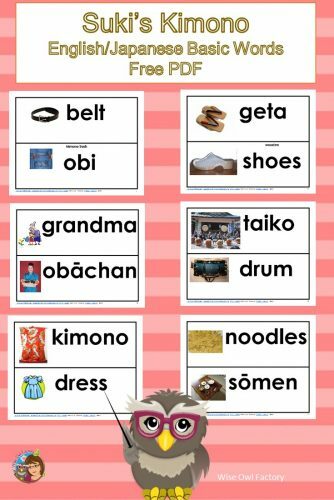 So along with the story, children will learn the words kimono, obi, geta, and more Japanese vocabulary. Japanese written with the Roman alphabet is called Romiji, according to my daughter who recently visited Japan. 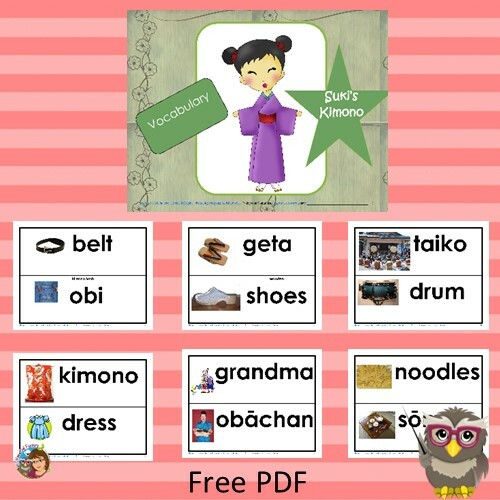 My free PDF is for the teacher today, and has pocket chart vocabulary words from the story matched with their meanings. 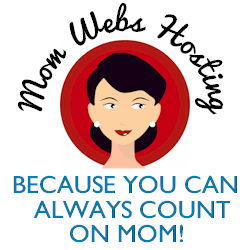 Click on these words for the FREE printable, or click on the photo below. This is a new book for me, but it sounds fun. Thanks for sharing at The Children’s Bookshelf. Cute and creative! You have a wonderful supplemental resource for this book! How nice is that? 🙂 Have a good Monday. I’m about to head back to school after Spring Break….so hard to do! !